Calculating and figuring out how much tax you have to pay is nobody’s favorite time of the year, but if you plan carefully there are many tactics available at your disposal to make sure that your tax bill is not more than it has to be in 2017. Which tactics make the most sense can be figured out by analyzing your current finances, estimating your tax situations and identifying the financial transaction that might take place either this year or next year. You should get started now, and consider these tax tips before Dec. 31, 2017. You can set yourself for tax savings in 2018 by making a loan to your lower-income spouse, family members or family trust so that he or she can pay the tax on any investment income on these dollars going forward. To avoid the attribution rules, you will need to charge the prescribed rate of interest on the loan. Until Dec. 31 the rate is 1% and can be locked at this rate indefinitely. Your family member will have to pay the interest on the investment by Jan. 30 each year, for the previous year’s interest charge. You will have to report the interest on this investment and your spouse can claim a deduction for it. You can come out ahead as a family, if your family member earns more than 1 percent annually on the investments. In a TFSA account, all dividends, interests and capitals gains your investments make are tax-free. 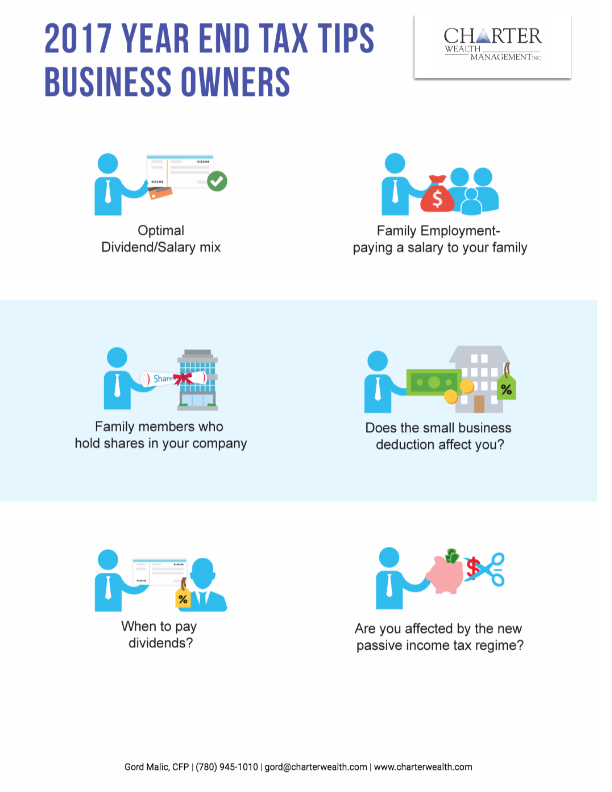 This is a huge advantage because as you continue to reinvest dividends and interest, the compounding income will also be tax-free. So before Dec. 31 consider lending money to your spouse or adult child to contribute towards his or her TFSA. The contribution limit to a TFSA for 2017 is $5,500, and up to $52,000 in total if you have been 18 or older since 2009 when TFSA was introduced, and you haven’t contributed yet. The attribution rules won’t apply to TFSAs since there is no taxable income, as long as the money remains in the plan. If you own investments with unrealized capital losses, consider selling them before year end to realize the loss and apply it against any of the net capital gains you have realized during the year or in the prior three years. If you intend on doing this, consider completing all trades prior to December 22, 2017. Canada Child benefit (CCB) was introduced in 2016 and provides a meaningful payment to many families on a monthly basis. CCB is a tax-free monthly payment made to eligible families to help them with a cost of raising children under the age of 18. The benefit payments are recalculated every year in July based on the income tax and benefit return information of the previous year. 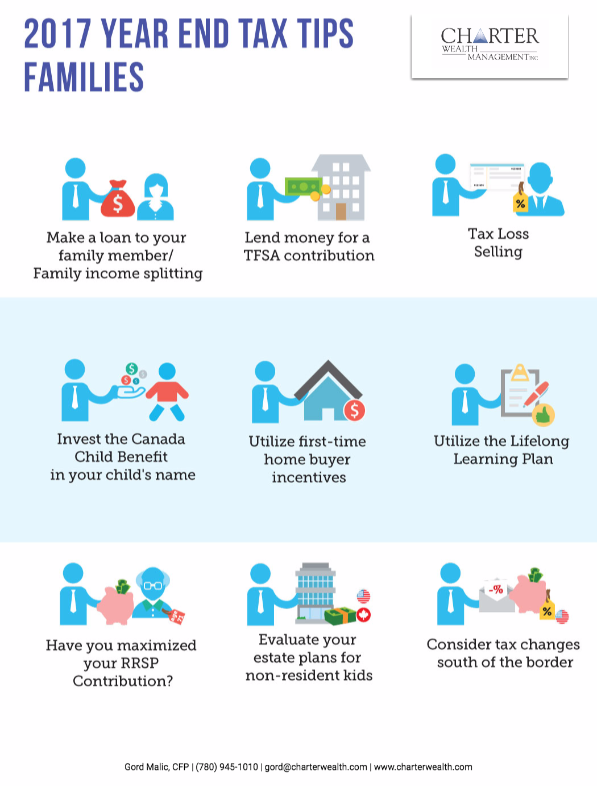 Consider investing these dollars in your child’s name, in an in-trust account. The attribution rules will not be applied to the income and growth of these dollars, as they can be reported in the hands of your child, generally facing little or no tax. This strategy can allow the funds to compound at a much faster rate. The lifelong learning plan (LLP) allows you to withdraw amounts from your RRSP to finance full-time training or education (or part-time if you have a disability) for yourself and your spouse or common-law partner. Consider making a withdrawal before Dec. 31, you are entitled to withdraw up to $10,000 annually or $20,000 in total from LLP. You will have to repay the withdrawal amount over time. Have you maximized your RRSP Contributions or is it time to wind-up your RRSP? Technically, you have until March 1, 2018 to make your RRSP contribution for 2017, however if you turned 71 in 2017 and need to wind up your RRSP, remember you only have until December 31, 2017 to make a contribution to your RRSP for 2017, not March 1, 2018. You should revisit your estate planning if your children are not currently residing in Canada, and particularly if they plan to remain non-residents long term. Consider adjusting your will or other planning for non-resident children and plan it together with your kids. If you are a U.S. citizen residing in Canada, you should be alert to any proposed taxed changes in U.S which can affect your tax planning heading into next year. President Donald Trump’s tax proposals include reducing the number of tax brackets and increasing the dollar thresholds where the rates apply, increasing the standard deduction, eliminating the deduction for medical costs and state and local taxes, and eliminating the alternative minimum tax, among other things. Consider talking to us prior to year end if you would like to act on any of these tips.